The Lutherans of the sixteenth century consistently maintained that their cultus and confession were truly catholic: ...nothing has been received among us, in doctrine or in ceremonies, that is contrary to Scripture or to the church catholic;1 ...No novelty has been introduced which did not exist in the church from ancient times...;2 ...our churches dissent from the church catholic in no article of faith but only omit some few abuses which are new and have been adopted by the fault of the times...3 According to the Lutherans it was Rome, and not Wittenberg, that had departed from the authentic catholic faith of the apostles and Fathers of the Church. Was this claim valid? Was the Lutheran doctrine of justification truly catholic, or was it (as the Pope and his followers claimed) a sectarian innovation? 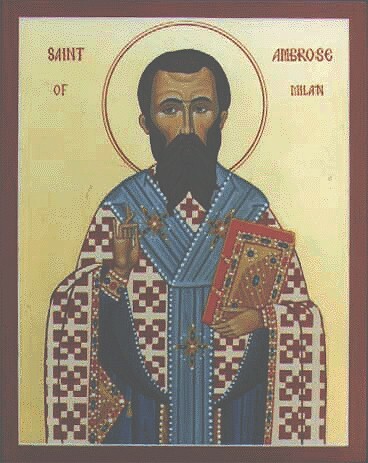 Since the Lutherans appealed explicitly to the ancient Father St. Ambrose (among others) as one who taught what they were teaching, it will be helpful to examine Ambroses writings on justification to determine if the Lutherans really understood his position and if his teaching did in fact confirm theirs. St. Ambrose (c.338-397), Bishop of Milan, has always been remembered as a courageous churchman, an able teacher, and a faithful shepherd. Christendom has also counted him as one of the eight Doctors of the Church, and an examination of his writings readily confirms the appropriateness of this honor. Sin abounded by the Law because through the Law came knowledge of sin and it became harmful for me to know what through my weakness I could not avoid. It is good to know beforehand what one is to avoid, but, if I cannot avoid something, it is harmful to have known about it. Thus was the Law changed to its opposite, yet it became useful to me by the very increase of sin, for I was humbled. And David therefore says: It is good for me that I have been humbled [Psalm 119:71]. By humbling myself I have broken the bonds of that ancient transgression by which Adam and Eve had bound the whole line of their succession. Hence, too, the Lord came as an obedient man to loose the knot of mans disobedience and deception. And as through disobedience sin entered, so through obedience sin was remitted. Therefore, the Apostle says: For just as by the disobedience of one man the many were constituted sinners, so also by the obedience of the one the many will be constituted just [Romans 5:19]. Here is one reason that the Law was unnecessary and became necessary, unnecessary in that it would not have been needed if we had been able to keep the natural law; but, as we did not keep it, the Law of Moses became needful to teach me obedience and loosen that bond of Adams deception which had ensnared his whole posterity. Yes, guilt grew by the Law, but pride, the source of guilt, was loosed, and this was an advantage to me. Pride discovered the guilt and the guilt brought grace. Consider another reason. The Law of Moses was not needful; hence, it entered secretly. Its entrance seems not of an ordinary kind, but like something clandestine because it entered secretly into the place of the natural law. Thus, if she had but kept her place, this written law would never have entered it, but, since deception had banished that law and nearly blotted it out of the human breast, pride reigned and disobedience was rampant. Therefore, that other took its place so that by its written expression it might challenge us and shut our mouth, in order to make the whole world subject to God. The world,24 however, became subject to him through the Law, because all are brought to trial by the prescript of the Law, and no one is justified by the works of the Law; in other words, because the knowledge of sin comes from the Law, but guilt is not remitted, the Law, therefore, which has made all men sinners, seems to have caused harm. 1. Augsburg Confession, epilogue to XXVIII, 5 (Latin), in The Book of Concord, translated and edited by Theodore G. Tappert (Fortress Press, 1959), p. 95. 2. Augsburg Confession XXIV:40 (German), Tappert pp. 60-61. 3. Augsburg Confession, prologue to XXII, 1 (Latin), Tappert p. 48. 4. Apology of the Augsburg Confession IV:389, Tappert p. 166. 5. Epistle 4, The Fathers of the Church, Vol. 26 (Washington: Catholic University of America Press, 1954), p. 104. 6. In ps. 47 enarr. 17; quoted in F. Holmes Dudden, The Life and Times of St. Ambrose (Oxford: Clarendon Press, 1935), Vol. II, p. 606. 7. De fide III:36; quoted in Dudden II, p. 607. 8. De Fuga 44; quoted in Dudden II, pp. 608-09. 9. Epistle 72, The Fathers of the Church 26, pp. 93-93. 10. Expos. ps. 118, 20:42; quoted in Dudden II, p. 631. 11. Exhort. virginitatis 43; quoted in Dudden II, p. 632. 12. Expos. ps. 118, 20:42; quoted in Dudden II, p. 631. 13. De Poenitentia II:72; quoted in Dudden II, p. 626. 14. In ps. 43 enarr. 14; quoted in Dudden II, p. 627. 15. De Poenitentia I:53, The Nicene and Post-Nicene Fathers, Second Series, Vol. X (Grand Rapids, Michigan: Eerdmans reprint, 1983), p. 338. 16. De Virginitate 100; quoted in Dudden II, p. 628. 17. Quoted by Augustine in Contra Julianum II:8:23; quoted in turn in Martin Chemnitz, Examination of the Council of Trent, Part I (Saint Louis: Concordia Publishing House, 1971), p. 475. 18. Liber de Jacob et Vita Beata, ch. 2; quoted in Chemnitz, Examination I, p. 508. 19. Exhort. Virginitatis 43; quoted in Dudden II, p. 627. 20. Liber de Jacob et Vita Beata, ch. 6; quoted in Chemnitz, Examination I, p. 507. 21. De Excessu Sat. 11:6; quoted in Dudden II, p. 610. 22. Not to be confused with the second-century church Father St. Irenaeus, Bishop of Lyons. 24. It is at this point that the Apology begins its quotations from this letter. 25. Epistle 73, in The Fathers of the Church 26, pp. 466-68. In the translation of Epistle 73 that is found in that source, Ambroses Latin phrase quia ex praescripto legis omnes conveniuntur et ex operibus legis nemo iustificatur  is rendered inaccurately as because all are brought to trial by the prescript of the Law, and no one is justified without the works of the Law. This is corrected in the quotation that appears in this essay. This essay was published in Lutheran Synod Quarterly, Vol. 28, No. 3 (September 1988), pp. 71-80. The printed version differs slightly from the online version that appears here.